The hostel is very well located, near from KR 7a and Av. Chille, two arterials streets in Bogotá. Always clean and chill, it has cozy rooms with confortable beds. Julio, Maria and all the staff are very friendly and helpful. 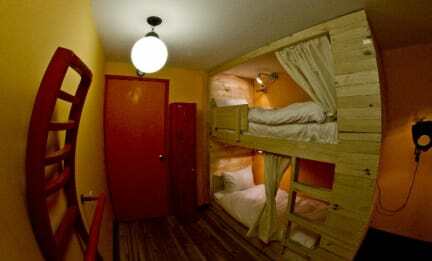 I had a realy good experience on 12:12 hostel and i strongly recommend it! The hostel is great. 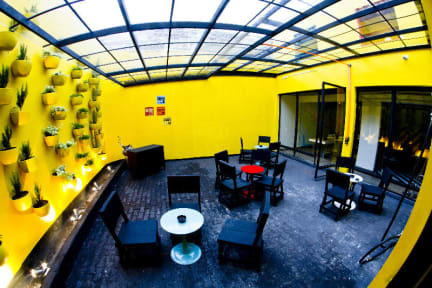 Its located in a neighborhood with amazings restaurantes and stores to visit. Nice and quiet place to walk. The bed was really confortble, and the shower was good as well. The staff were amazing with me, Maria and Julio, nice guys and very helpfull. I missed a bar or place to drink with the travellers, if the hostel could have one, would be perfect. I recommend this place to stay. Muito bom o hostel. Sua localização, em Chapinero é muito boa, muito seguro, para quem quer sair a noite, é bem tranquilo chegar e sair do hostel. As instalações são boas, o atendimento super bom tb. Achei que poderia ter mais atividades para socializar, e dicas de passeios, tours na cidade, um pouco mais de informações. Mas no geral é um bom hostel sim. De uma forma geral, achei o albergue com um otimo custo x beneficio. A unica parte chata foi que o banheiro fica no primeiro andar e a maioria dos quartos no segundo. Mas o pessoal que trabalha no hostel foi muito receptivo e sempre dispostos a ajudar e dar informações. Nosso quarto estava sempre limpo e arrumado, e o albergue se localiza perto da Zona Rosa (de dia iamos caminhando para lá, a noite de taxi - por volta de 6.000 COP's a corrida). O Hostel é muito tranquilo e muito bem localizado! O quarto que eu fiquei foi ótimo e tudo se procedeu muito bem! Esse hostel não tem serviços internos ou café da manhã incluído, para o viajante isso pode fazer diferença . I didn't have a great staying at 12:12. It's a beautiful and clean accomodation, but the hostel is very noisy: the bedroom door makes A LOT of noise when someone opens/closes it and if someone speaks at the living room you will definetely hear from your bedroom. The bathroom is in the floor below the bedrooms which is very unconfortable - plus: I had the bad luck of exactly when I was soapy during a shower, they have had lack of water for more than 15 minutes.